I asked my friend and colleague, internet strategist Claire Gallagher, to talk to me about her work and to share some of her tips on how to make your website work for you. Claire's background is in graphic and web design, and we worked together in Paris for several years, before she moved down to Montpellier in the south of France and became a consultant rather than a web designer, and I began writing books. Claire is, like myself, a believer in the DIY path, and does one-on-one consulting to help people bring their website ideas to life. We talk often on Skype, but since we don't work together any more, I wanted to catch up with her latest thoughts. Could you explain exactly what is internet strategy? When I’m asked, I just say, “I help people grow their businesses online.” I help freelancers and small business to plan, create and promote their own websites through one-on-one consultation sessions and workshops. Web strategy isn’t just about making a website for your business. It’s a bit broader than that. I like to refer to it as a business plan for web. Your strategy covers planning, creating and growing your presence online, which covers everything from websites to social media and list building. How did you transition to this role from graphic and web design? What made you shift emphasis towards training and consultation? I was a graphic designer for print, then made the move quite naturally to be a web designer when I worked in commercial agencies. I really enjoyed the flexibility of web. When something is printed, it’s done! There’s no going back. But web is ever-evolving. I moved more into consulting and training because I saw a real need for a service like that when working as a freelancer. I felt I could be useful as a consultant because I love to meet people and talk about ideas. Having worked in as a graphic designer and web designer, I saw similarities between the two, and the problems people encounter often come down to project management, not budget or motivation or skills. People who want to do create their own sites often get stuck because they can’t see the wood for the trees. As you've seen yourself, they don’t know where to start and get overwhelmed by options. I wanted to help people to enjoy the design process by helping them get to the heart of their project with strategy, project structure, design and technical advice. Do you think that anyone can build their own website? I totally agree with you Alannah, that now, more than ever, it’s possible for people to create their own websites. With so many ready-to-use platforms and templates available at affordable prices it’s absolutely possible to create something great on a small budget and with limited technical skills. Sometimes it’s good to get help (like from your book!) for the setup stage, but yes, if you set out with a good plan and the right guidance, I don’t see why not. What are the major challenges for your clients? What are the problems that you see people struggling with again and again, and what are the best ways of dealing with these problems? I’d have to say that the biggest challenge for most people is getting started. Sometimes a busy entrepreneur won’t have time. Sometimes people get lost in a tidal wave of online advice from different sources, some of which can lead you down the wrong path or simply give you information overload. Sometimes people are in such a rush to get online, that they invest in a designer, developer and all sorts, only to come out the other side with a site that doesn’t achieve what they wanted or a site that they have no idea how to use. So the starting point is a really important one and an intimidating one. If you start out on the right path, you’ll end up where you want to be. I’m a big nerd when it comes to planning. I think it’s so important to think a project all the way through, rather than diving into your project with no map in place. When you put a plan in place you get perspective on the project as a whole and you can take things one step at time rather than trying to do everything at once. What are your best tips for people wanting to build their own websites? Pick up a pen and paper. Silence your phone for a bit and sit somewhere you can think in peace for at least an hour. Decide what you need your site to do, who it should reach and how you’re different from all the others out there. Write it all down and keep it as a reference. Get perspective before getting stuck in! And if you’re tearing your hair out, invest in help. What do you think are the most common pitfalls people should take care to avoid? Plan for the ongoing maintenance as well as the initial build. Not focussing on the content. A lot of people get caught up on how a site looks. The content is at the heart of everything. Text should be well written. Images should make sense for your style. The specific audience should be considered and tailored to, otherwise you’ll just end up talking to yourself and have no visitors on your site. Not planning any kind of promotion or customer follow up. Again, this all goes back to planning. Your site could be absolutely, award-winningly beautiful, but if your customers can’t relate to it, or find it, it’s not going to do anything for your business. Think about your customers, and what they need from you and their interaction with the website rather than going crazy about animated sliders and snazzy visual effects. What are your favourite online tools - and any other tools you rely on for your business? I’m in love with all things Google. I use Google for email, Google Drive for saving and sharing files, Google Hangouts for webinars and group calls, Google Analytics to check out the action on my site. And mostly everything is free and easy to access! I use MailChimp too which is also free for up to 2,000 subscribers (although I use the paid versions for all the extra fun tools). MailChimp is used to collect subscriber emails and communicate through email campaigns. There are loads of options out there, but I just think that MailChimp has everything you need and is easy to use. Which particular platforms do you recommend for people to use? And which ones do you get asked for help with most? I use WordPress by choice, but it’s definitely not for everyone. You have to be ready to learn a bit and also to maintain the site regularly or you’ll just end up with problems. Weebly I find really good - and I know you like it as well. It’s got some nice design options and is really easy to use. It’s my go-to recommendation if WordPress is too technical. The prices are pretty affordable too. I use WordPress myself for websites, and I think the real winner with WordPress is the Divi theme. It’s insanely versatile. You can make it do pretty much anything, and their support is excellent too. It's no coincidence that both you and I are using Divi on our websites right now! Are there any other great secrets you'd be willing to share with the readers? I love Buffer for automated social media sharing. Hootsuite have a great blog. I follow Paul Jarvis and Fizzle for no-nonsense insight into the world of freelancing and creative business. I regularly refer to Melyssa Griffin for tips on blogging for online growth. I did her Blog to Biz course and it was quite interesting and useful. I also use Pinterest as a place to find inspiration. You’re a graphic designer yourself so you have the skills to create wonderful-looking visuals for your own site. But how do you advise your clients to deal with this aspect, since they don’t usually have the knowledge or ability to create graphics themselves? I’m very quick to recommend Creative Market. It’s like a top quality stock library for everything from fonts, images, and illustration packs, to themes and graphics templates. The standard is really high and if you need a suite of graphics it’s much more affordable that working with a designer or illustrator to create something bespoke. I must admit that I use graphics from there too. I simply don’t have time to create things from scratch. I edit the graphics to suit my needs. When it comes to editing images, I also recommend Pixlr.com which is like a simplified and free version of Photoshop. The most important aspect of creating graphics though is consistency. Choose a style and stick with it, because a consistent style equals a stronger brand message. It’s often tempting to change styles on your site when you get bored of them, but be careful about reinventing everything too often. It can confuse people and weaken your brand message. And most importantly, get help with graphics if you’re really stuck or don’t have time to figure it out. If in doubt, keep it simple. Pop over to Canva and use a template. Which social media do you use most and why, and which do you get the most engagement with? I recently fell in love with Pinterest, but it’s actually more of a visual search engine than a social network. I get a lot of information and ideas from the various pinners and bloggers I follow. I also tweet and find interesting articles on Twitter. But it can be hard to build a real following there. There are so many algorithm followers - that's when tweeters use robots to automate follows based on hashtags with the hope you’ll follow them back. It’s a bit annoying. Most of my engagement comes from Facebook. Specifically through Facebook groups. It’s nice to be part of a community on Facebook rather than just scrolling through the newsfeed to see who’s had a baby or run a marathon. I’m part of some great, inspirational and supportive groups on Facebook. I try to be useful and offer support where I can, and sometimes that turns into paid work, which is a nice bonus. You offer lots of different resources for DIY website builders on your website. Which of these do you think are the most useful for your visitors? 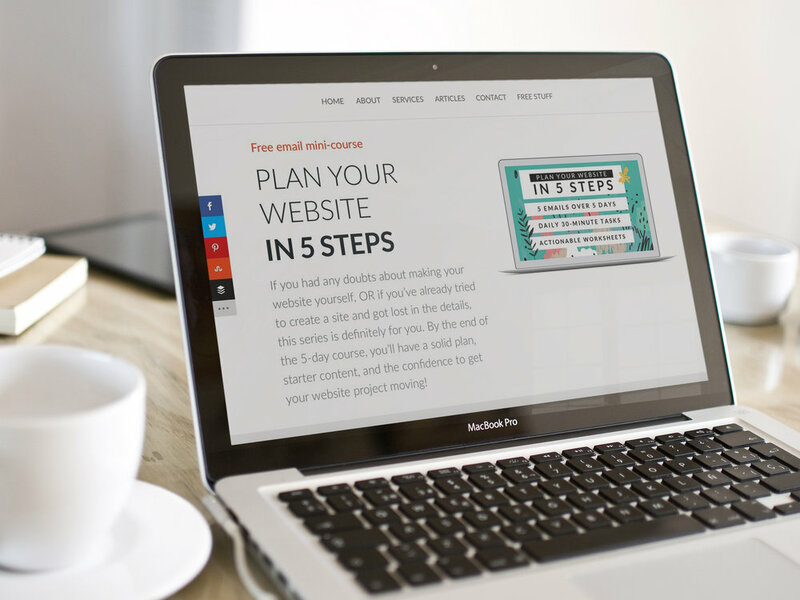 In this mini course, you get an email a day for 5 days, each with a 30-minute task. By the end of the 5 days, you’ll have a plan for your site and access to some really great resources to help you create the online presence that suits you and helps you start building an online following. It’s intended to help anyone stuggling to get started. 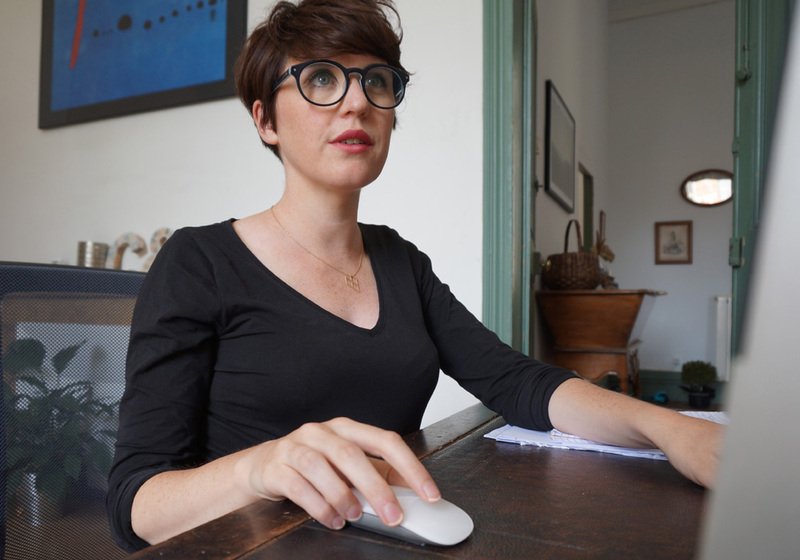 You live in Montpellier, France, and conduct most of your work via Skype. Where do most of your clients come from, and what are the benefits of working in the way that you do? I love the chilled-out Montpellier lifestyle. And working from home means no commute, no public transport or rush hour traffic. I get to talk to people all day long as consultation is at the heart of my business. Most of my clients are in Paris, the UK and Ireland. A lovely mix of people! My clients get to work from their own offices too, which is an advantage because they can carry on working after the session has ended. I guess the disadvantage would be that I don’t have the buzz of an office environment. I’ve worked in a number of different design and communications agencies in Dublin, London, Melbourne and Paris and it’s true that it is fun to work with other creatives. As a way to remedy this, I started a mastermind group here in Montpellier and we meet regularly to bounce ideas, share new tools and try out new places for lunch. What are your best tips for people running a web-based business - whatever kind of business it may be? If you work from home: set your office hours and stick to them! If your website is your whole business, be sure you have proper security in place and ALWAYS have a recent backup. Thank you very much for sharing these insights and tips, Claire! You can click over to Claire's website at Claire Creative and download some of her DIY website building resources. Her new mini-email course sign up is here.